This dish was absolutely fantastic. As you’ve heard me bemoan the fact that I’ve been less than inspired lately, this meal hit the spot. Not only that, but the entire family raved about it. The kids had been announcing the fact they were SO SO SO hungry for the last hour before we ate. Must have been true! They licked the entire bowl of pork, pineapple, scallions and rice completely clean! I was pleasantly surprised. Another HUGE bonus in my book.. this recipe only took 30 minutes to prepare, not a lot of dishes and it was one dish to serve! All the prep work was super simple and fast. The fragrances coming from the kitchen had my hubby nosing around and the kids biting my ankles for tastes as I was working. The greatest compliment I can ever receive on a meal is for my husband and 3 year old to equally love the meal. I feel like that is quite a feat! WOW! What aspirations I have… the acknowledgement of a 3 year old…. but you other mamas out there know exactly how that feels! There was no begging for a bedtime snack due to the fact that their plates weren’t cleaned at dinner or that they ate just enough to not be “famished”. Makes the dinner table enjoyable when everyone is enjoying what they have been served! Lately ALL three of the kids hum/sing as they eat if it is a meal that is particularly delicious! It’s quite comical to watch and so fun to know that they really are enjoying what’s been made for them! So on to this fantastic recipe! Check it out! Preheat the broiler with the rack at the highest setting. Place the pork, scallions and pineapple on a rimmed baking sheet and toss with salt and pepper. Spread all the ingredients into a single layer. Broil about 6 minutes on each side for chops that are about 1” thick. Transfer pork to cutting board and cut into slices. Add tamari, fish sauce, sushi vinegar, juices from the pork and pineapple broiling tray and 1 TBSP water to the saute and heat until bubbly. Don’t cook too long or it will cook away. Once cooked and hot pour into VitaMix and puree until smooth. Add last TBSP of water to get a thin, but not runny consistency. Serve over rice. 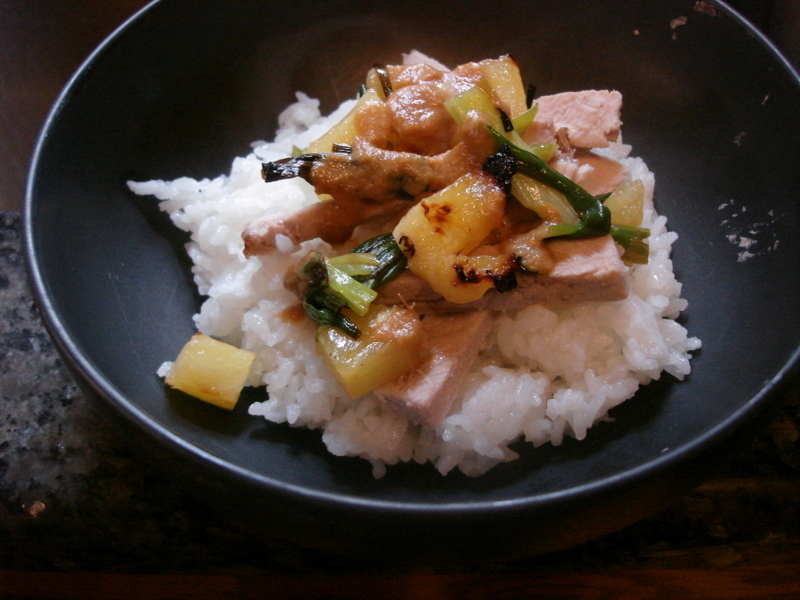 Top rice with slices of pork, broiled pineapple and scallions and drizzle the sauce over the top. Serve warm. This dish is SO SUPER FANTASTIC that I’d love to make a HUGE pot of it and invite you over! So try it and let me know what you think!